Handmade in Honduras, Maxx by Alec Bradley cigars contain a blend of tobaccos from Colombia, Nicaragua, Mexico and Honduras, along with a savory Costa Rican binder. These elements combined produce a full and complex flavor, one that has satisfied countless aficionados since MAXX's debut. You can't beat this cigar for price or the flavour. These are always in my humidor and well deserving of its 96 rating. This is the best cigar I've found and enjoy at a great price. Only issue is that there's always a couple of cigars that come with a "twisted/crossed vein" making the draw hard. Alec Bradley MAXX is one of my all time favorite cigars and is always in my humidor. The quality and flavor stick to stick is incredible. For the price you can afford to smoke this cigar everyday. If you are a maduro fan I can't recommend this cigar high enough. toasted well, started mild and built throughout entire hour and a piece. first third was thinking it was too mild by the second third it took off, smooth creamy great draw, last third the burn line kinda wonked out but no big deal. was sad when it was over just like saying goodbye to a good friend. Grate taste and body. This cigar have become one of my favors. It will never let you down. I really like the Maxx Culture. So decided to buy to the smaller version for that quick smoke. These are great, The only problem is they don't last too long in my humidor. MAXX The Fix is rated 3.7 out of 5 based on 11 customer ratings. 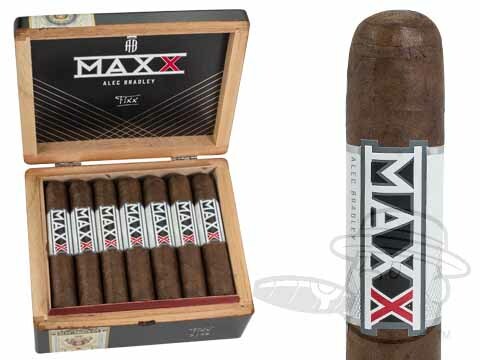 The cigar with the largest ring gauge in the Maxx line is The Freak, which is a 6 3/8x 60. It's listed as a medium to full bodied, and boasts a unique blend of filler tobaccos from Mexico, Honduras, Columbia, and Nicaragua. Fans of the Maxx claim there is no other cigar quite like it. The Gran Habano Czar Corojo #5, as you stated, is 6x66 and is known as Gran Habano's most powerful cigar. It is listed as a full-bodied cigar, and features a spicy Corojo wrapper, which is sure to give it a little extra "kick". For another fuller-bodied, bigger-ring cigar you might want to check out the Medici Botticelli by Alec Bradley (6x60) with its rich Habano wrapper, or the Berger & Argenti Entubar Gran Toro (6 1/2x64), which showcases the unique "Entubar" method of cigar construction.